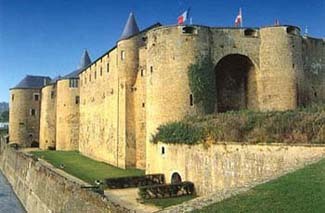 Although the first documentation of Sedan dates from the 9th century, the building of the fortress didn’t begin until the 15th century. In 1424, Evrard d’Arenberg, Count of La Marck, laid the foundation of what was to become Europe’s largest fortress. The towers were added over the following centuries. Henri Robert de la Marck and Françoise de Bourbon declared Sedan and its surrounding twenty-two districts a sovereign principality. After some generations of de la Marcks, Frédéric, to save his head, ceded the property and principality to the king of France. In 1962 the French army gave the property over to the town of Sedan. The hotel has an elevator to some of the top floors, but keep in mind, steps are involved throughout. A few rooms are equipped for the disabled. Some of the top floor rooms can be warm during hot days. Sedan is just short of the border with Belgium. From the A4, exit “Sedan Château Fort.” Sedan also has a railway station. On site: guided, torch light tours of the fort. What can a town do with a huge fortress dominating it? By turning it into a museum and terrific accommodations, its preservation is guaranteed for centuries to come. Not only that, but this castle hotel is a superb value. Classified three-stars, guest rooms vary from small to large. Taking advantage of the medieval architecture, rooms can feature parts of the original walls. Windows are small, in keeping with the defensive nature of the fortress. If the rooms seem dark, just remember where you are! Decor is on the older side of contemporary; bathrooms are modern, but can be a bit small. Some rooms feature old fireplaces. An excellent restaurant is on the premises. Classified as a monument historique, this is the largest fortress in Europe.